Here is one of my "Cream-Crusty" vegan sandwich recipes. I love "Cream-Crusty's" because they provide the perfect open-faced bread base to highlight some amazing fruit. In this recipe, I highlight the super fruit, the mango! 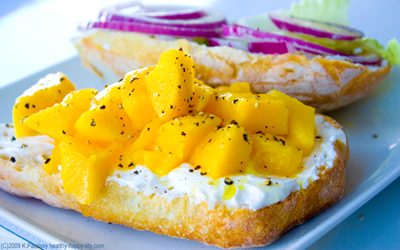 This recipe combines the sweet tangy flavor of a juicy mango with the savory creaminess of tofu cream cheese. Accented with some fresh black pepper, lemon juice and red onion - the flavor pops! Zesty sweetness indeed! Slice the mango into cubes. Place in bowl. Slice a fresh ciabatta roll. Spread tofu cream cheese on each side. Spoon mango cubes on top of cheese. Layer onion slices and lettuce. Leave open face, or close and slice. Open face is recommended for easiest eating! (It also allows the mangoes to stay plump and perky, not squashed and mushy. Add additional black pepper as desired. Additional ingredients: Dill and fennel compliment this crusty well. Fresh chopped jicama would also add a nice light crunch to this sandwich. Mango Super Fruit Facts: MANGO!